Congratulations to Mr & Mrs Bothman who were married today. 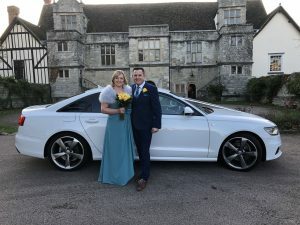 The Happy couple choose the White Audi as their Wedding car. Sharon and her Daughter as Bridesmaid were Chauffeured in style from the Great Danes Hotel Maidstone to the Archbishops Palace Maidstone. After the Ceremony Robert and Sharon were Chauffeured to the White Horse Pub for their Reception.